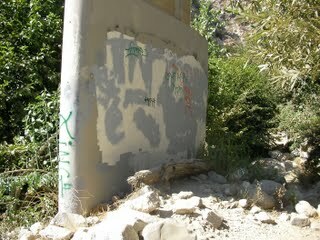 Okay, this picture may not be the most inspiring, but for anyone who may have felt a bit depressed by my June post with photos and video of the extreme defacement of Eaton Canyon, north of the Mt Wilson Toll Road bridge, I have some good news . Last weekend I hiked the trail, and was pleasantly surprised. First, while the creek was dry about 1/3 of the way up, the water was running over the falls, and was still creating enough of a pool that there were people swimming and enjoying themselves in it. But more importantly, all the June graffiti was painted out. As you can see from the photo above, some tags have reappeared, and some of the abatement paint jobs are not the most artful, but before you gasp in horror at the thought of painting over rocks to "remove" graffiti, it really is a gigantic improvement, and the ham-handed cover-up paint job shown in the photo in only obvious because it's on a smooth surface. On rocks, the texture forces the paint-over to be more mottled and blend much better than this. I didn't get any photos of the cover-up of the "murals" at the falls (there were some women swimming and I didn't want to be creepy), but they're far less noticeable, and a major improvement. On the Stonehill News email group, there was some discussion about the pros and cons of painting over vs removal. I was concerned that removal might actually be worse because of the difficulty in containing any solvents or waste that would result. So in my view, painting over is not ideal, but the only thing better would be a magic wand that prevented the graffiti in the first place. Graffiti has been will continue to be a constant problem along that trail, and as such, the rocks are were already coated with layers of abatement paint long before the major defacement I photographed in June. 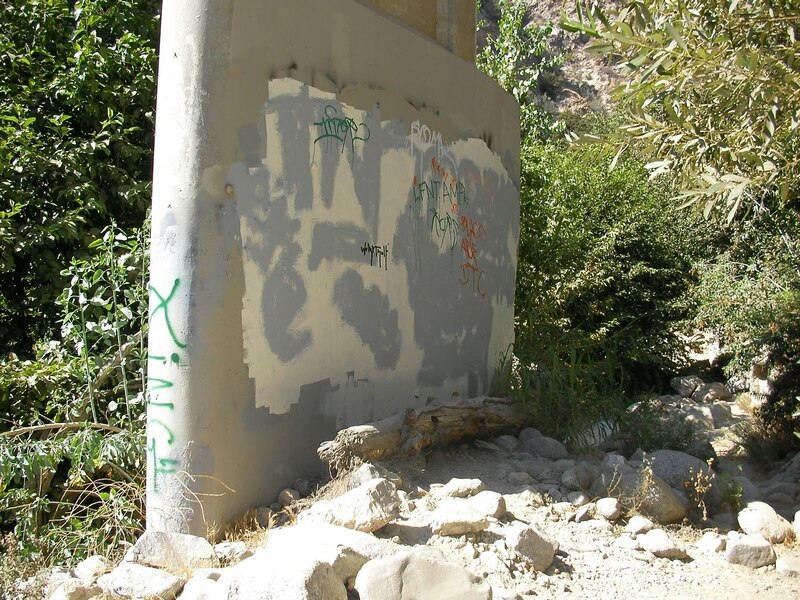 If you're a geologist or naturalist looking for pristine nature, you will might want to pick a different trail for hiking, but in a general sense, seeing the graffiti kept at bay so efficiently makes me feel like we live in a civil society. The somewhat grim news I have is that while coming out of the wash I encountered a large family group staging at the bottom of the Toll Road, preparing to hike in. There were several children and adults. They were carrying folding chairs, back-packs, a cooler, etc. The grim part is that they were all dressed in kind of "gang-ie" looking clothes, consisting of tight straight braids and bald heads, black baseball hats, black baggy t-shirts or white tank tops, thin gold chains, baggy shorts, etc., and there was a large new can of Krylon industrial marking paint sitting on the ground amidst their supplies. As I approached them and spotted the paint, I commented (with a wink and a smile) something like, "you're going to use that to cover up graffiti, right?" They looked a bit surprised for a moment and then laughed it off, and went on to admire my dog (she's a pit-bull, and they liked the breed). In any case, despite it having been notably better in terms of the level of graffiti, there were already a few tags here and there, and I assume there's a good chance that the group I encountered added their own markings when they went in. Every time I've used this hotline, the problem has gotten cleaned up very quickly, so please do use it if you see graffiti yourself. Forest Service (mostly volunteer labor, by the way) is using a prduct called "Taginator" that melts away the spray paint and is reportedly inert once it hits the soil or water.